Get the best access to your most anticipated SXSW 2019 events with SXXpress (South by Express) Passes! Back for 2019, digital SXXpress Passes are an essential resource for SXSW registrants to not only secure a spot at must-see events but also jump to the front of the line. New for this year, all SXSW Badges – Platinum, Interactive, Film, and Music – can request priority access to individual Conference sessions and select parties (also new for 2019), Music Festival Showcases, Film Festival Screenings, and Comedy Festival Showcases. 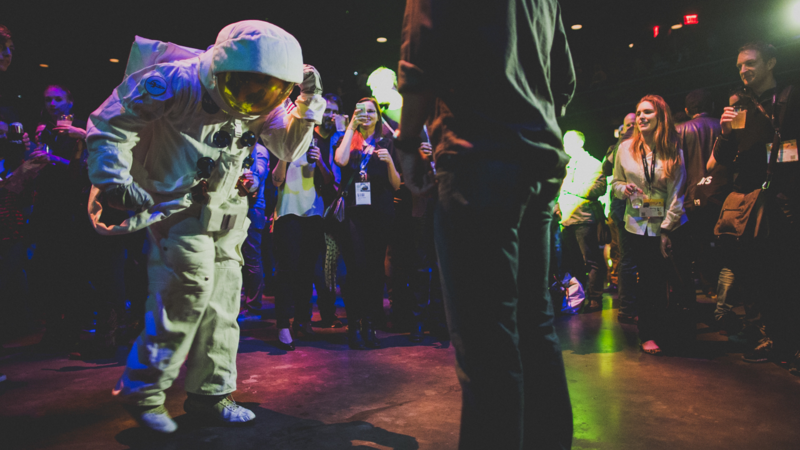 Dive into SXXpress Pass steps and tips below to make the most out of your SXSW experience. 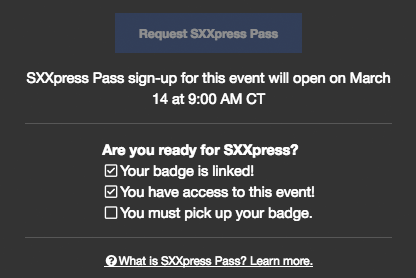 Are You Ready to Request a SXXpress Pass? Before you can make any requests you must log in and link your badge in SXSW GO mobile app or at SXSW Social using the Badge Link Code found in your registration confirmation email. You must have your physical, printed SXSW Badge before requesting SXXpress Passes – pick up your badge from Registration. A helpful checklist will appear next to all eligible SXXpress Pass events on the SXSW Schedule or SXSW GO mobile app. Check all the boxes and you’re ready to request! You have your physical, printed SXSW Badge. Tip: If you are too early to request your SXXpress Pass? Set a reminder on your phone. Tap on the event’s “Request SXXpress Pass” button to proceed. “Confirm Pass Request” – there are no exchanges. “Congrats!” – a confirmation email is on the way. The email will include the registrant’s name (you!) and the event’s date, venue, time, and a link to download to Apple Wallet or Android Pay. How Many SXXpress Passes Do I Get With My Badge Type? SXXpress Passes can only be requested for events that your badge has primary access to (Tip: Upgrade to a Platinum Badge for primary access to all events). Signup begins on Thursday, March 7 for events on Friday, March 8 and ends on Saturday, March 16. Learn more about SXXpress Pass access, request periods, event lines, and more on the SXXpress Pass page.